The Other Side blog: Zatannurday: The Amazing Adventures of Zatanna! I have been spending the week with Amazing Adventures. While Amazing Adventures is a "Pulp Era" game there is no reason that you couldn't use it for a Modern Game. In fact it might be fun to try doing something more Silver Age. A while back I did a Pulp/Golden Age version of Giovanni "John" Zatara for AA. So I am saying this version of Zee exists in the same universe. 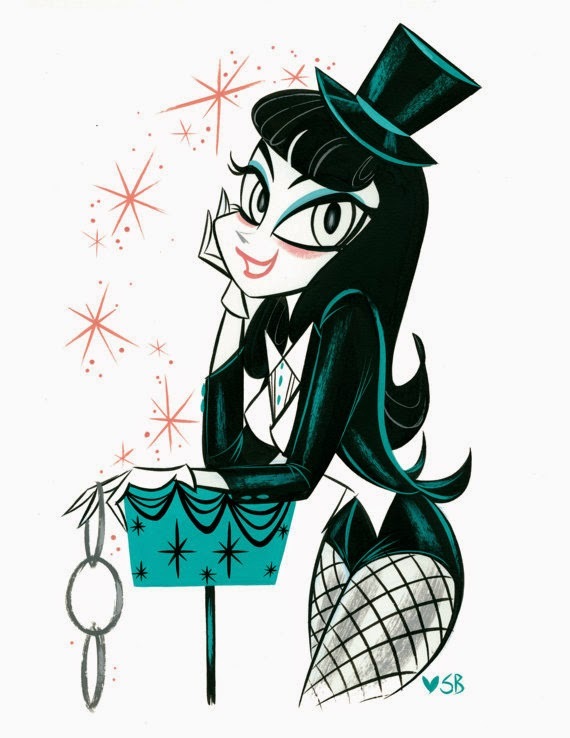 This is a young Zatanna. Maybe soon after her first appearance with the Hawks, but long enough that she has some magical experience. *Zatanna is a member of the Home Magi race. She gains a +1 to CHA and a -1 to CON. Zatanna, as a quirk of her own style of magic, must speak all her spells backwards in order to work. A note about spells. I opted for spells that look best on a stage or in front of a group of people. So no fireballs or even a lot of damage causing spells. Also I choose spells I felt she had access too; ones in her father's library. Zee gets her own powerful collection of spells later on.